Why is there so much public confusion over the vote count? A thorough recap is available here, but the Cliffs Note version is Republican leads in the races for Senator and governor have been shrinking as more votes have been counted and added to the tally. Specifically, it’s the late arriving mail ballots and provisional ballots filled out on Election Day that have closed the gap. The Republican response has been to question the legitimacy and claim – without evidence – that fraud is the reason for the narrowing gap. Those claims were stoked by current Republican governor and candidate for Senate Rick Scott, who ordered law enforcement to investigate liberal Broward and Palm Beach counties for fraud, where the bulk of the vote has come from. Those investigations have found no evidence of wrongdoing. And Trump being Trump, despite the accusations being baseless and refuted by both law enforcement and Florida’s Department of State, he’s now claiming the count is invalid and can’t be trusted. In a particular case of ridiculousness, Trump believes this means we should treat an incomplete total from earlier as final because his side was ahead. In reality, the vote count trending towards Democrats is completely legitimate and logical if you spend more than 30 seconds thinking about it. Provisional ballots will by definition be added to the official count after regular ballots cast on Election Day, and mail ballots can be received days later and take time to process. Both of these are less efficient to organize and count than a ready made pile from a precinct cast on Tuesday, and higher population counties (which generally vote Democratic) will naturally have more ballots to count. It’d be a surprise if the late count didn’t lean blue. To be 100% clear on the situation: After investigations by law enforcement, there’s zero evidence of fraud or any form of dishonesty or manipulation in Florida’s election, and any lack of confidence in the results are the product of Republican misinformation and spin. What’s the probable end result of all this? For governor, Republican Ron DeSantis is a heavy favorite, and Democrat Andrew Gillum’s chances likely depend on how many provisional and mail ballots haven’t been counted yet, because a 33,000 vote margin is probably more than any machine errors. But it’s good for American democracy we’re taking the time to check. For Senate, things are much more in doubt. The difference is only 12,500 votes (out of nearly 8.2 million), and there’s a weird issue with undervotes in Broward County that could be a machine error, which could easily flip the result. Undervotes are where a citizen skips a race on the ballot. Typically, it happens more as you go farther down the ballot and the contests are for less prominent races (voters rarely skip over President while voting for local judge). Given that governor and U.S. Senate are offices of similar status, we’d expect the undervote to be very small in either direction. And in this case they are, EXCEPT for Broward County. There’s simply no logical reason so many voters in only one county would vote for Governor and skip the race for Senator. Neither candidate for governor had a tie to Broward that the Senate race didn’t, and interest and advertising spending was similar between the two races. 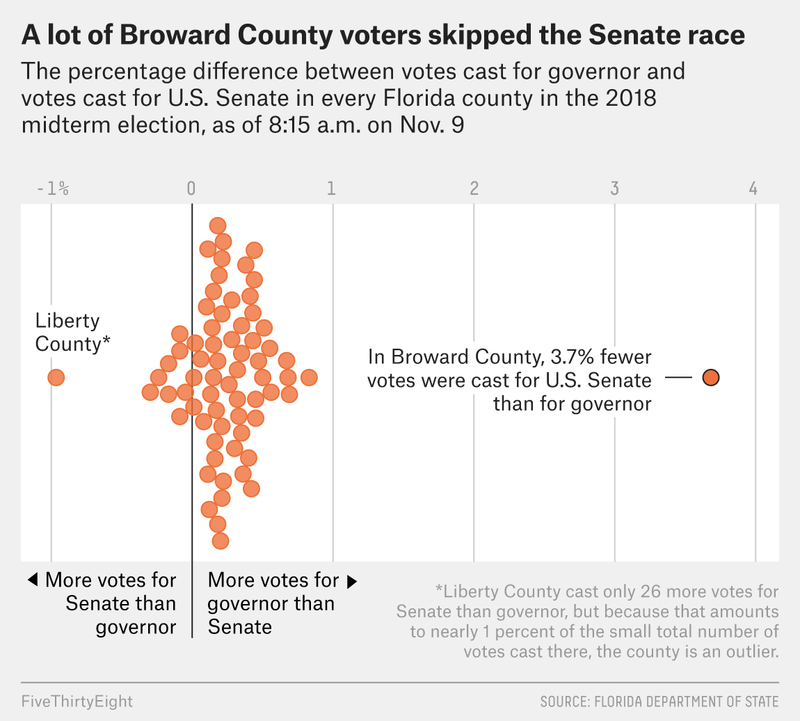 1) If the Senate was accidentally skipped by a lot of voters in Broward due to ballot design, Scott wins. Even if those citizens intended or thought they had voted, it won’t (and shouldn’t) matter if they missed the race. 2) A machine error missed votes for that race during tabulation. If this is the case, the hand recount will probably flip the result and Nelson will hold the seat. This is why Scott (and now Trump) are pushing so hard to stop the recount and throwing every baseless accusation against the wall they can find. The second option seems very plausible and would keep a key Senate seat blue. More than anything else, what this demonstrates is the desperate need to put consistent election standards and guarantees into place regarding how we vote. I’ll have a follow up post tomorrow arguing why we need a Voters’ Bill of Rights.